Chamonix has a reputation for great off-piste skiing. While many other ski resorts in Europe offer better groomers, fancier restaurants, and arguably a much more civilized on-piste experience, Chamonix still draws the more adventurous, wild and crazy among us. But not all off-piste skiing in the Valley needs be crazy. There are lots of great runs at a more reasonable level of "adventurousness" that are simply fun. The big glacier descents off the Grands Montets are examples, with reasonable skiing in a fantastic setting. And the Vallée Blanche is something every skier needs to experience. 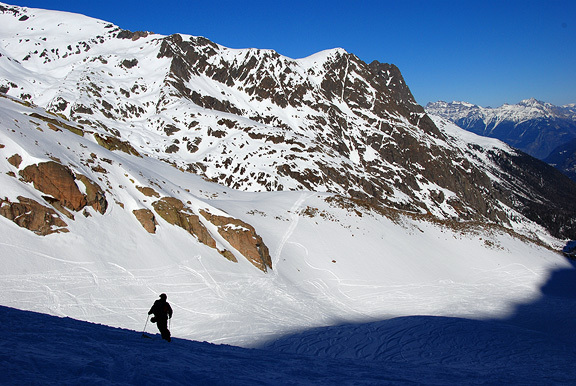 On this page we describe a number of off-piste options. You could spend days, or even weeks and months here, and not explore it all. Many of the options are accessible with normal downhill (alpine) ski equipment. While others require the use of skins and touring gear. The use of skins allows you to travel where the masses of downhillers can't make tracks. The best season is usually from the end of January through to the end of March. During this time frame we are often available for booking on a private basis for you or your group. Please contact us if you have questions not addressed on this web page. This incomparable ski descent is justifiably famous for its impressive glaciers, giant surrounding peaks, and skiing very close to seracs and icefalls. It makes for an unforgettable day's outing. There really is no single "Vallée Blanche". Not only are the numerous routes down the complex of glaciers which feed into the Mer de Glace, but every day brings an unique mix of weather and snow conditions. We ski this route at least a dozen of times each season, and it always feels fresh and surprising. Normally, we take an entire day to make the descent. We like to savour the experience, and perhaps also stop for a hot lunch on the deck of the Requin hut. However, if time is short you cans ski it straight through, with few stops, and be back in Chamonix some 5 hours after you start. The descent is feasible for downhill boots and skis, and is often down with this gear. We start with a ride up the Aiguille du Midi cable car. Exiting from the top, we rope up for the short, but exciting descent of the snow ridge on the east side of the peak. We carry skis for about a hundred meters here until the angle eases. The rope then gets put away, and we step into our skis. Here, we have to decide on the best choice for a descent route. There are quite a few factors that can influence this decision, but most important are you ski abilities and interests, as well as where to find the best snow, and at the same time manage potential avalanche and crevasse risks. The main routes down: The "Classic" takes a more moderate line around the south side of the Gros Rognon. 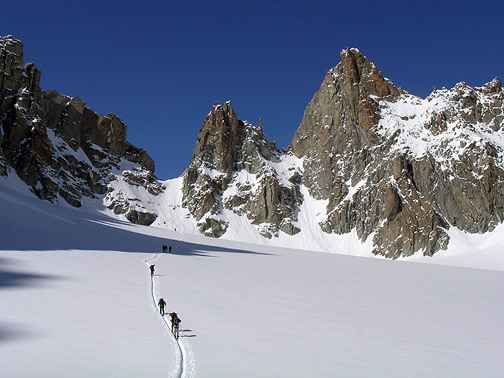 This route can be spiced up a bit by staying close under the Gros Rognon as the glacier drops to the east. The "Vrais Vallée Blanche" drops though a zone of big crevasses just on the north side of the Gros Rognon. The "Petite Envers" is further to the north east and offers many options, all ending close to, and usually to the north of the Petit Rognon. The "Grand Envers" is the most northerly of the Vallée Blanche options. It climbs a bit at first, then drops very steeply to the glacial bowls to just under the southern walls of the Chamonix Aiguilles. All routes end on the lower Mer de Glace. If there is good snow cover all the way down to Chamonix, we can ski into town. If the snow cover is thin or legs tired, then we can catch the cog railway at Montenvers and ride this down into town. While the easier routes down the Vallée Blanche are not overly steep, the skiing does take you quite close to some very large and dangerous crevasses. You'll need to ski in perfect control in these situations. Also, being off-piste, the snow quality can vary tremendously. Skiers should be advanced intermediate or better is skill level. You'll need to be able to ski big bumps in tight terrain with parallel turns. 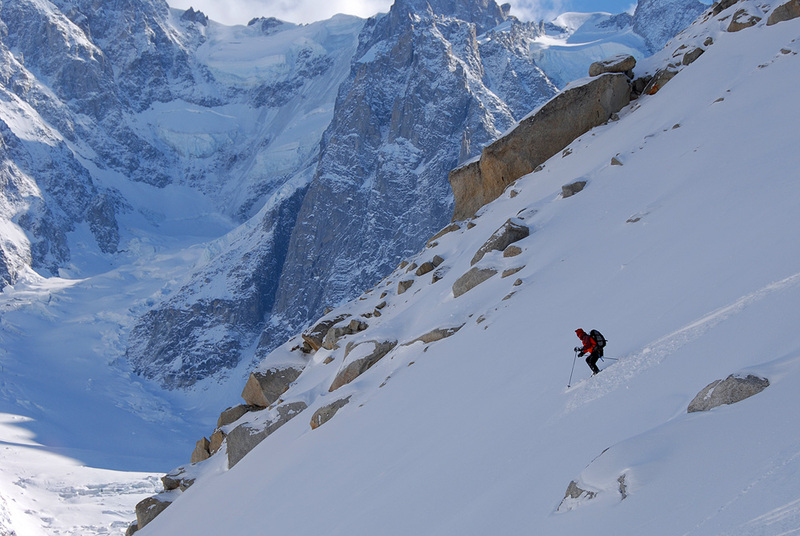 The very alpine start of the Vallée Blanche. Skiing under the top station of the Grands Montets. 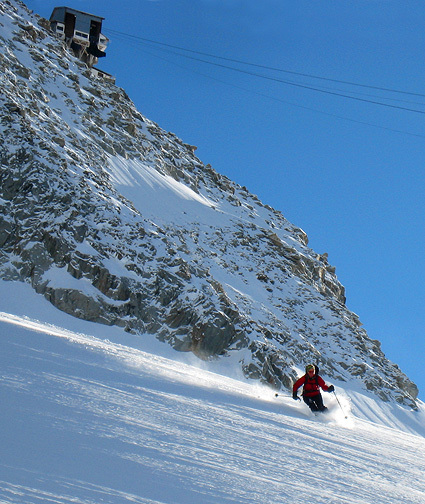 The Grands Montets is the biggest and best (most skiers will agree) of the five areas in the Chamonix Valley. It has three main things going for it. First is the shear size of the skiable terrain, nothing else in Chamonix comes close. Second, it faces north, so snow remains light and cold for days on end. And last, the top lift of the cable car access some great glacier skiing, with lots of options for the adventurous. All this comes at a bit of a price, however. The area, especially the top cable car, can be quite crowded. So much untracked snow is a seriously strong magnet for many skiers, and on a sunny day, after a big snowfall, they all seem to want the same thing! But once you arrive on the summit of the Grands Montets at 3300 meters, no matter which way you go, it is a long way down, and with so many choices of descent one soon forgets about the crowds on the lift. There are three main off-piste options from the summit. The most commonly used, and perhaps the best is the Glacier des Rognons, which, in turn leads down to the Argentière Glacier. The variations on this route are much too numerous to outline here. Another great route off the top is to the north, steeply down the glaciers of the Pendent and the Lognon. And last, the Pas de Chévres and its variants are the most wild and intimidating routes for the adventurous skier. These last end at the Montenvers cog railway, and join the Vallée Blanche skiers here. Fortunately, it is not necessary to get to the top of the Grands Montets lift to find great off-piste skiing. The Bochard lift, gives access to the bowls of the Pendent. And the Herse, on the other side of the ski area, to the Combe des Amethystes. Last, the "Dream Forest" located in the trees just to the east of the Retour Pendent chair lift. Mont Blanc and the Chamonix Valley from Le Tour. 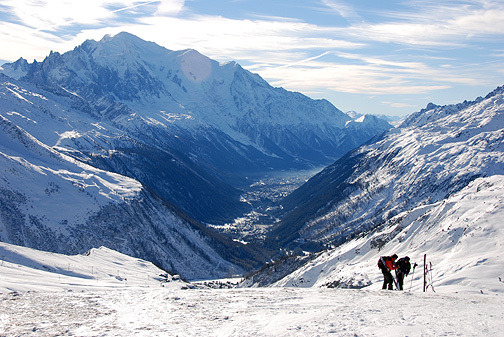 Most skiers know Le Tour for its sunny, wide-open slopes facing the Chamonix Valley and the Mont Blanc massif. This side of the area offers fun, generally easy, open skiing with fantastic views. But the "back-side" has a completely different character. Here, the slopes are steeper, more complex and, lower down, offer great skiing in the trees. Also, the north-facing aspect keeps the powder longer. The Brévent is one of the two ski areas on the southeast facing sunny slopes of the Aiguilles Rouges, just above and to the north of the Chamonix. 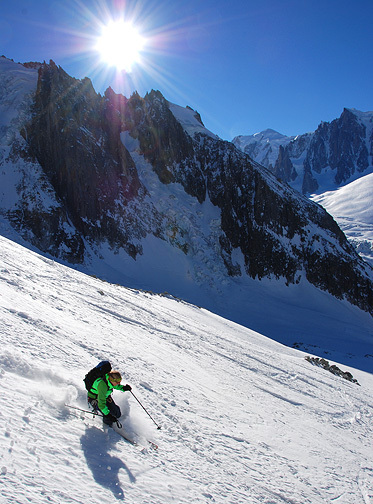 The two attributes that make this area unique are the incredible views–looking straight across at the entire Mont Blanc Massif, and the steep chutes and couloirs easily accessible from the top station. Skinning up to the Fenêtre de Saleina. This is a big day of randonnée skiing. Randonnée skis with skins are needed here, as well as the possibility of boot crampons for the steep descent of the Col du Chardonnet. The route starts at the Grands Montets, descends to the Argentière Glacier before climbing to the Col du Chardonnet, Col number one of three. After a short but very steep descent (sometimes done on foot and sometimes on ski) and a bit more moderate downhill on the Saleina Glacier, another skin and short boot pack takes us to Col number two, the Fenêtre de Saleina. The final Col, the Col du Tour, is quickly reached and a long descent to the village of Le Tour follows. The total descent is 2760 meters (9050 feet) with a total elevation gain of 955 meters (3132 feet). This is a big day, and skiers need to be quite fit, well experienced with randonnée gear (skill at kick-turns on steep slopes) and good off-piste skiers. Looking down the Combe de Bérard towards Le Buet. The Crochues-Bérard tour starts in the La Flégère ski area very close to Chamonix. From the top of the highest lift, we skin up steeply to the Col des Aiguille Crochues, climbing the last section on foot. Stepping into our skis we descend to about 2300 meters before climbing up again, on skins to Col de Bérard. From here, it is a long downhill to the village of Le Buet. We catch the train that brings us back to Chamonix. Total descent is 1540 meters (5050 feet) and the total ascent is 420 meters (1380 feet). There are many variations to this tour, some taking in steeper terrain, but the simplest, the one described here is a good choice for skiers with some randonnée experience, and good skiing ability. Ramsay, skiing in the Vallée Blanche.